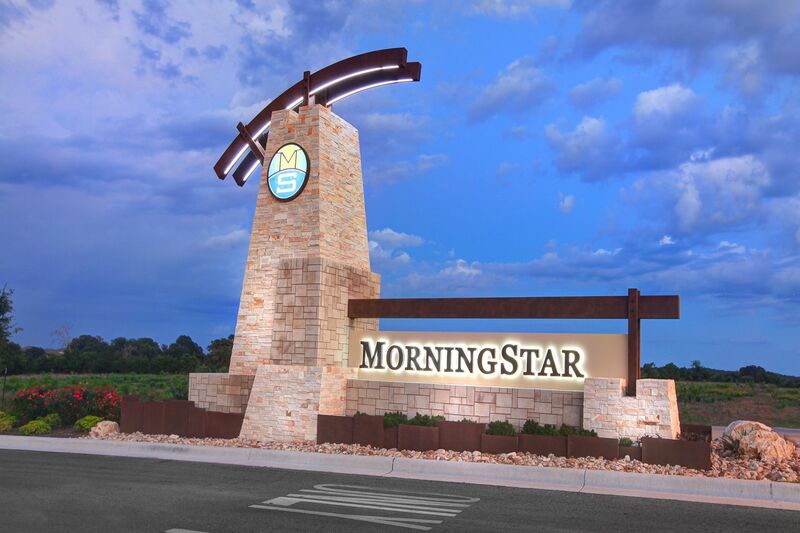 MorningStar, a rising star in Texas Hill Country, is a master-planned new home community that feels far away from the fast pace of Austin, but in reality it’s only 25 miles north in Georgetown, which means you can easily get to everything the city has to offer in an easy drive. That is, if you want to leave Georgetown. Victorian-era buildings dot the historic downtown, and it proudly claims to have the most beautiful town square in Texas, where events like live music, First Fridays, Arts Festivals, a Farmers’ Market, and the famous Red Poppy Festival take place year ‘round. There are a number of parks where you can enjoy the outdoors, and Lake Georgetown, with its fishing, boating, swimming, camping, and hiking, is just minutes away. When you drive into MorningStar it feels like you are coming home to a resort. There is a swimming pool and open-air pavilion, a splash pad, a playground, a fire pit, and even a dog park. 1.5 miles of hiking and biking trails wind past ponds, including a stocked fishing pond and soon-to-come exercise stations. Things are getting even better in 2019 with an addition of the Stargazer Event Lawn! This space will be the central gathering place for the community featuring grills and tables, as well as games like Washers, Disc Golf, and Four Square courts! The new homes are part of our Smart Series collection, which feature stellar design at an exceptional value. You get to choose from a number of professionally coordinated design packages that ensure every detail of your new home is perfect, and perfectly yours. The homes are set on 50’ wide homesites—some of which are greenbelt and cul-de-sac lots—and everywhere you look, there are beautiful views of Texas Hill Country. Easy access to both Highway 29 and Ronald Reagan makes daily commutes a piece of cake.